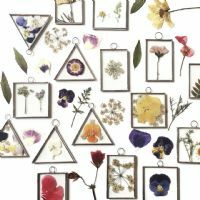 After finding an amazing vintage glass terrarium at a second hand shop and a glass pressed flower frame at a car boot, Nikki James knew she had to find out how to make my own. She studied stained glass at Orchard Studios in Bristol where she was taught the copper foiling method. Everything is handmade by Nikki in her home studio with every piece hand cut and hand assembled by grinding, shaping, copper foiling and soldering each and every piece.